New York — Hudson Yards’ climbable staircase, temporarily known as Vessel, opened to the public on Friday, March 15. 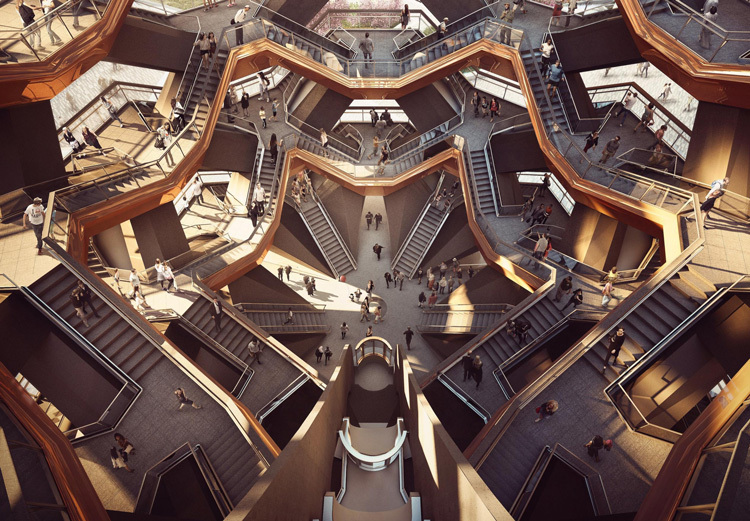 Designed by Thomas Heatherwick and Heatherwick Studio, Vessel is the centerpiece of the Hudson Yards Public Square and Gardens. It is comprised of 154 intricately interconnecting flights of stairs, 2,500 individual steps and 80 landings. Standing 150 feet tall, Vessel offers a one-mile vertical climbing experience and some of the most unique views of the new neighborhood. Vessel was fabricated by Cimolai S.p.A. in their Monfalcone, Italy facility and arrived on Manhattan’s West Side in six separate shipments after travelling for 15 days at sea, a brief stay at Port Newark and a five-hour barge trip across the Hudson River. Vessel was constructed from a structural steel frame that was covered by a polished copper-colored steel cladding. It sits at the center of the Public Square and Gardens, which was designed by Nelson Byrd Woltz Landscape Architects in collaboration with Heatherwick Studio. Featuring more than five acres of gardens and groves, the new plaza seamlessly connects to the High Line and Hudson Park & Boulevard. This summer, the Hudson Yards Public Square and Gardens will house more than 28,000 plants, 200 mature trees, woodland plants and perennial gardens.